Having just put my kids down for the night, had a chance to read the story. It was an email from Cameron Von St. James, a story of hope and faith amidst shattered plans when bliss turned into fear. Lives turned upside down. 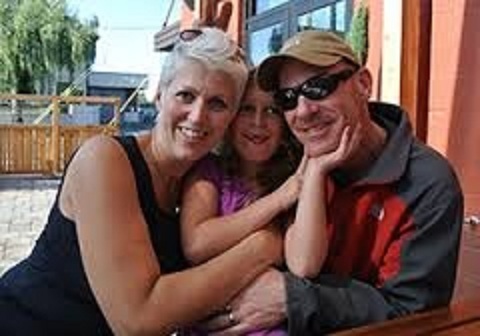 A mere three months after giving birth to their first child, Lily, in August of 2005, Heather Von St. James (Cameron’s wife) was diagnosed with malignant pleural mesothelioma, a form of cancer due to asbestos exposure where life expectancy is measured in months. I struggle to imagine what it would be like to look at your newborn child not knowing how long you would be able to look. Cameron immediately faced the role of caregiver and the future of raising Lily as a single parent. “The day my wife was diagnosed with cancer is one we will never forget. That was also the day I learned how unprepared I was to become a caregiver for someone diagnosed with this awful disease. We had just welcomed our first and only child, Lily, into the world three months prior, and instead of celebrating Lily’s first Christmas as a family, our lives were turned upside down by Heather’s mesothelioma diagnosis.” Cameron asked if I would share their story, and spread awareness of this little known cancer in which 95% of those diagnosed die within two years. Am quite honored to do so, Cameron and Heather. If there is one universal truth, and we don’t know exactly when, it’s that we all will run out of time at some stage of our lives. That is what faced Heather and Cameron, a diagnosis clock that read 15 months and counting, with the survival rate prognosis meter at 5%. Imagine if we all knew we how much time we had to live, with a clock on our forearm to remind us. What would you discover about yourself? Author of the best seller “the five secrets you must discover before you die” John Izzo gathered wisdom from over 18,000 years of experience, interviewed over 200 people between ages of 60 and 100 voted wisest by their peers. Live True to Yourself – It was Socrates that stated “The unexamined life is not worth living”. The message is to live your life with intention and purpose, follow your heart and ask yourself if you are in fact focused on the things that matter to you; make those matters a priority. By being true to yourself, you honor yourself. No Regrets – Do you enjoy having to say “I wish I had”? What if you were taking steps based on courage not fear? At the end of our lives we will only regret risks we did not take, not risks we took that did not work out they way we hoped. Live with courage, take risks of the heart and truly reach out rather than away from what we fear. Choose Love – Love is a choice not just an emotion, and is fundamental to a happy and purposeful life. That power to choose love transforms us. In my mind, it is a purposeful commitment to sacrificial action for another. Be There in the Moment – It all goes by so fast, the days can be long yet the years short. Life is certainly better lived than viewed and to live in the moment means to be fully in every moment of our lives. Wise people see each day as a great gift. Do not rush through those moments of joy, experience and engage each one of them. Be Giving – Those who give the most find their greatest joy. What I have learned about giving to and serving others is that your heart changes, perspective is gained, as does appreciation. The important things in life are not things; rather time, relationships, presence, and active engagement with others. Being giving comes from a place of understanding and compassion, and can change the pattern of self-centeredness which influences choices. The clock started during the holiday season of 2005. Amidst all the gifts expected under the tree, this story once again reminds me that the best gifts are the ones not found there at all. Being Lily’s first Christmas, it was intended to be such an exciting time and one of anticipation for Cameron and Heather. Being new parents, they spoke of the holidays often that year, talking about the new traditions they wanted to create with Lily along with old traditions they wanted to keep. Then, a mere three days before Thanksgiving, the diagnosis came and stripped all of their happiness away in an instant, Heather was diagnosed with mesothelioma. As they learned more, the reality set in that the future suddenly became very uncertain. Cameron was angry and afraid, and while hoping for the best certainly pictured the worst. He could not remember why he looked forward to the holidays or what to be to be thankful for. Difficult conversations and decisions to be made, bills coming at a rate faster than ability to keep up, down to one income, how to stay afloat, care for Lily, and intense cancer treatments forthcoming where hope needed to be more than merely a granted wish. Cameron realized how mistaken he was, and pride was blinding him on what was truly important. Namely, a family who wanted to help and left their home to come to them. There to be with, and for, them when needed most. Offering help in any way possible and willing to make incredible sacrifices to help them through this uncertain and difficult time. Now that is something to be very thankful for, and is not found under the tree. It has been eight years since 15 months and counting. After intense mesothelioma chemotherapy, radiation, surgery, and the love and support of caring friends and family, Heather is eight years cancer free. They are about to celebrate another wonderful Christmas with their daughter and looking forward to many more. Cameron and Heather hope their story can provide some inspiration and hope to all those currently battling cancer this holiday season. Cameron, Heather, and Lily: thank you for the opportunity to share your story to encourage others. For you and for all, Merry Christmas.